Thanks to a steadily growing economy, the state’s FY 2016 revenue situation remains strong. According to the Department of Administrative Services, total General and Education Fund revenue, through the end of February, is $58 million higher than what was expected at this point in time. Furthermore, this does not take into account the $19 million attributed to the tax amnesty program that ran from December 1, 2015 through February 15, 2016. While over a dozen revenue streams flow into the General and Education Funds, three – business taxes, the meals and rooms tax, and the real estate transfer tax – have been responsible for the vast majority of the positive news. 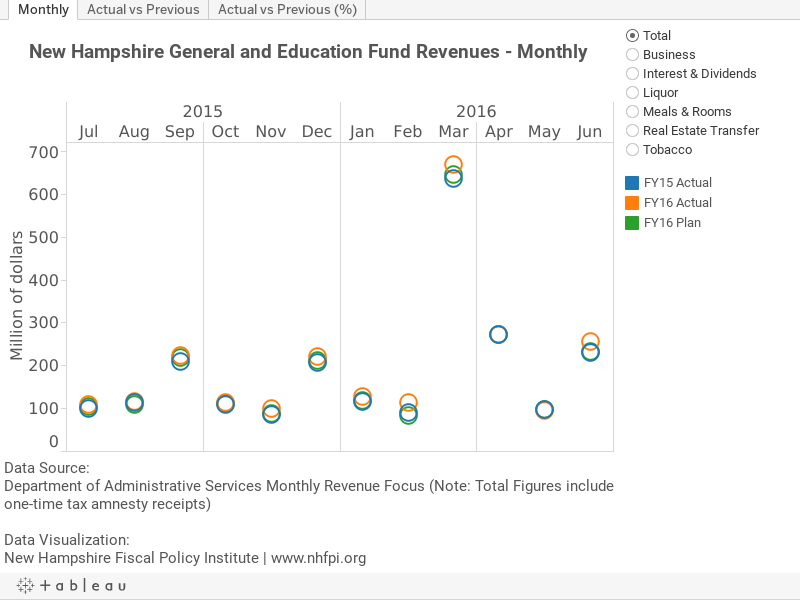 The strength of these particular taxes suggests that the New Hampshire economy is performing well overall, since these revenue streams tend to reflect trends in corporate profits, discretionary consumer spending, and household finances. Below the visualization are some of the numerical highlights from the latest report.